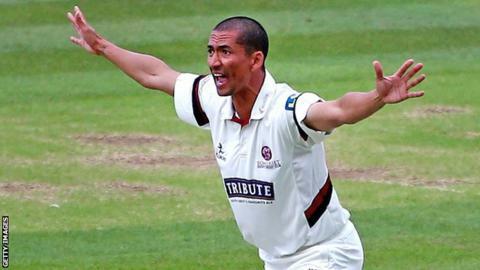 Sussex have signed Somerset seam bowler Alfonso Thomas on a one-month loan ahead of their One-Day Cup campaign. The 38-year-old South African is available to make his debut against Lancashire at Horsham on Sunday. "Alfonso isn't likely to feature for us in the One-Day Cup," Somerset director of cricket Matt Maynard told the club website. "We want to make sure that he is in the best possible condition for our run-in in the County Championship." Sussex have several seamers out injured, with James Anyon, Lewis Hatchett and Ajmal Shahzad all long-term absentees and Chris Jordan yet to return from a side strain. Thomas has taken 216 wickets at an average of 27.96 in his 164 career 'List A' appearances. "We want him to be playing competitive cricket over the next few weeks," Maynard added. "He will not be allowed to play against us if we make it in to the knockout stages of the competition, plus we can recall him with immediate effect if we need to."